Quick and professional Kenmore appliance repair service is just one call away! Although these appliances are well-known for their reliability, they may still develop some problems. If you happen to experience certain issues, contact our company right away. Over the years, we have helped numerous clients with their Kenmore home appliance repairs. Whether it’s a washer, fridge or oven that is on the fritz, you can count on us. All you need to do is to book an appointment and one of the most qualified techs will be there in no time! 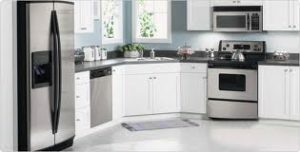 When it comes to Kenmore appliance repairs in Whitby, Ontario, our company is the best option. We hire only the most skilled and trained local technicians. Each pro is familiar with all types and models of Kenmore equipment. With the help of proper tools and original spares, they can complete any Kenmore appliance service in Whitby in one go. So if there are any troubles with your kitchen or laundry room machines, don’t delay. Just call us and we will take care of your concerns. In addition to Kenmore appliance repair, the local techs specialize in preventative maintenance. If you want to make sure your equipment runs well, get in touch with our company. Scheduling routine check-ups with Appliance Repair Whitby is the best way to ensure trouble-free operation for years to come. Have you bought a brand new Kenmore appliance? Turn to us for a professional installation! With years of hands-on experience, the Kenmore technicians of Whitby can fit any model in a matter of hours. Be it a gas range or electrical dryer, you can be sure the job will be done to your utmost satisfaction. When hiring our company for your Kenmore appliance repair, you can expect fast turnaround time and excellent service. No matter what problem you are having, the local expert will provide you with the right solution for your needs. So drop us a call today to learn more about our Kenmore appliance repair in Whitby. We look forward to hearing from you!